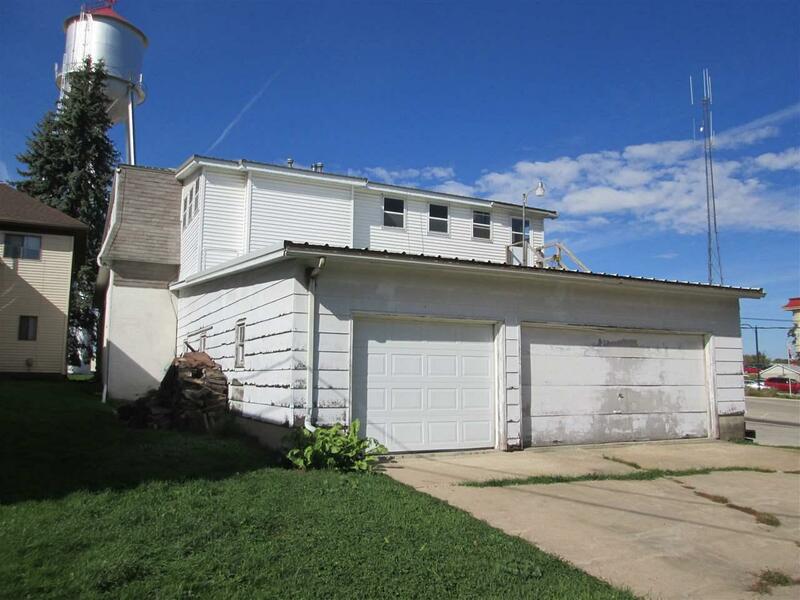 This is a 2 story concrete block and frame structure located just off the business district in West Union on a 54x 157 lot. The first level has 816 sq.ft. on the north side of the building, 1300 sq.ft. on the south side of the building, a 394 sq.ft. utility area and 3 car garage/shop area on the east side. The second level includes an enclosed porch with the entry to 2 2 bedroom apartments. Each apartment is 1,250 sq.ft. The garage and overhead enclosed porch also contain the access to a freight lift. The lift is mainly used for the convenience of moving furniture in or out of the 2nd story apartments. The building was originally constructed in 1948 as a 1 story concrete block building. The exterior block is coated with sprayed on polyurethane and the front side has an imitation rock wall masonry covering. In 1976 a second level, wood frame construction, was added along with an enclosed porch and an attached garage. The freight lift was added in 2001. There is no basement. The roof was covered with steel in 2010. 1st level north side: Was operated as a Laundromat, approximately 816 sq. ft., concrete floor, paneled walls and pressed board ceilings. The restroom that includes a sink and toilet is located on this side of the building and services all of the first level. No laundry equipment included. 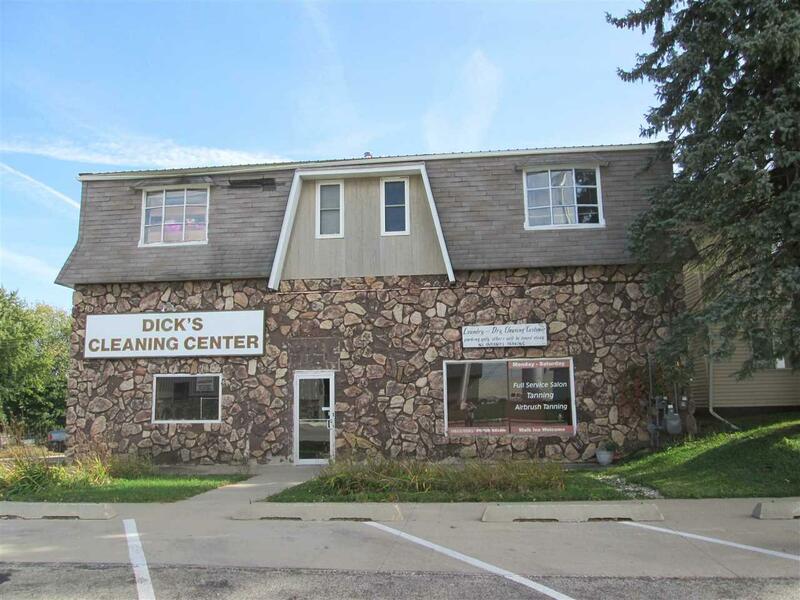 1st level south side: Was operated at a hair salon and personal care business, approximately 1,300 sq. ft., with insulated and sheet rocked walls, drop tile ceiling, concrete flooring with epoxy covering. Has several partitioned rooms, a waiting area, and office/counter area. Utility room: This room is used for storage and houses the utilities for the first floor, including the furnace, water softener and water heater. The furnace is a forced hot air, natural gas fired unit. The furnace services all of the first floor area. The water heater is 150 gallon and fairly new. The water heater services the entire building. 2nd level apartment (south side): Approximately 1,250 sq. ft. and includes kitchen/dining area, living room, full bath, storage room and 2 bedrooms. The walls are sheet rocked and textured, the flooring is carpeting and vinyl, and the windows are double hung replacements. This apartment is in very good condition, including the flooring. The furnace is forced hot air, natural gas fired. The unit also has central air conditioning. 2nd level apartment (north side): Approximately 1,250 sq. ft and is a mirror image of the south apartment. It also includes a kitchen/dining area, living room, full bath, storage room and 2 bedrooms. The walls are sheet rocked and textured, the flooring is carpeting and vinyl, and the windows are double hung replacements. This apartment is in slightly below average condition, mainly due to the condition of the flooring and some sheet rocking. The furnace is forced hot air, natural gas fired. The unit also has central air conditioning. 2nd level enclosed porch: This has the entries for both apartments and is accessed by an outside stairway or freight lift. The exterior has vinyl siding and steel roof. The windows are double hung and there is carpeting. 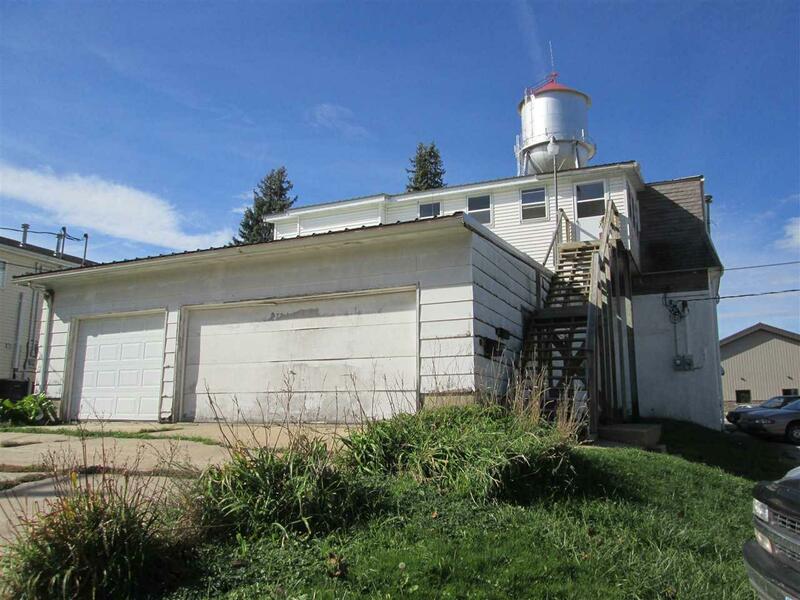 Garage: 3 car garage with approximately 1,280 sq. ft and a 444 sq. ft. storage/shop area on the west end. The storage/shop area has access to the freight lift and controls. The garage has masonite siding in poor condition, newer steel roof, 1 double garage door, 1 single garage door, (no electric openers), concrete floor, is insulated but not interior finished, alley access and a concrete drive/parking area.